Our greatest asset has always been the dedication of our exceptional people. Join us as we give special honor to this year’s business champions, 34th Annual Charles E. Piper Award Winner Ann Mackin and 9th Annual George W. Ashby Award Winner The James Joyce Irish Pub, while celebrating the entire BDC business community. The George W. Ashby Award for Business Excellence is a local honor named after one of Berwyn’s distinguished early architects. This award celebrates Berwyn's "Business of the Year" and its exceptional business enterprise. 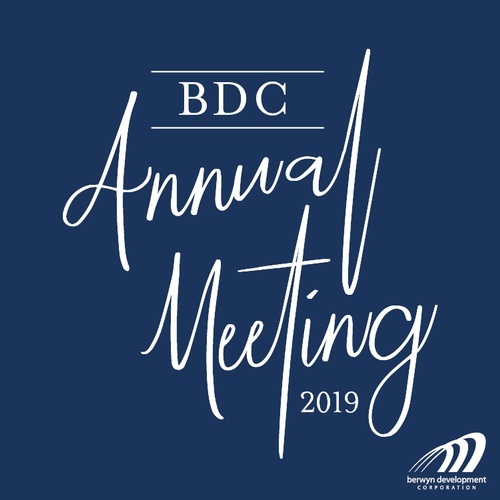 Attendees will also meet our newly elected BDC Board of Directors while networking with other BDC members and Berwyn city officials. Sharing in each other’s momentum will be well worth your time! Your complimentary admission for the evening includes an abundance of small bites, desserts and one complimentary drink ticket. Valet parking will be available. Registration includes complimentary hors d'oeuvres, desserts and one complimentary drink ticket.